1025 Thomas Jefferson St., N.W. Update: The Buckhead Coalition and area business owners have set up a Community Improvement District, funded by taxing area properties, to deal with Buckhead's traffic and pedestrian problems. The funds will used in conjunction with federal funds to pay for transportation improvements. Buckhead's growth and popularity as a work-shopping-residential district are its strength -- and its potential weakness. Traffic congestion and threats to neighborhoods are constant challenges. In a project sponsored by the Buckhead Coalition, the nonprofit Urban Land Institute assembled a panel of land use and development experts to take a look at the problem. Their recommendations build on the 1994 Buckhead Blueprint and envision a more pedestrian-friendly future. 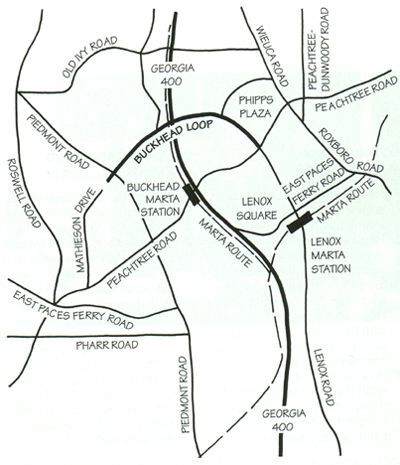 The study focuses on the Piedmont-Peachtree, Lenox-Peachtree and Buckhead Loop areas shown at left.. The first recommendation -- Create a more inclusive forum -- recognizes the diversity of voices in Buckhead and the need to pull together business and neighborhood interests. This is closely followed by: Preserve the character and beauty of single-family neighborhoods. The panel also urges inclusion of more housing specifically oriented to the active elderly so they will have options without leaving the community. The panel recommends improvements to turn roads into landscaped avenues, friendly to pedestrians and bicyclists. 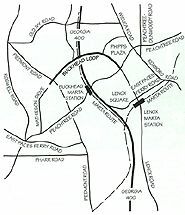 Peachtree Road recommendations include reducing speed, widening selected areas to create three lanes in each direction and a center landscaped median that provides left-turn lanes at intersections, and building sidewalks of at least 10 feet in width with well-defined crosswalks for pedestrians and bicyclists. From Buckhead Village to Roxboro Road, the panel recommends renaming the street Peachtree Parkway and including tree-lined public promenades on both sides. Lenox Road recommendations include widening to four lanes with left-turn lanes, making outer lanes 14 feet to permit them to be shared by bicycles and reducing the design speed from 35 mph anywhere that speed would require violating the existing landscape. Piedmont Road recommendations include installing a landscaped median and sidewalks between between Peachtree Road and the Buckhead Loop. Roxboro Road recommendations include enlarging the median to create a significant parkway and permitting an underlying stream to be developed into a water garden. Buckhead Loop recommendations include better landscaping and replacing the chain-link fencing with berms, plantings and attractive walls. Improve pedestrian circulation and access to MARTA is the fourth recommendation. The panel suggests a pedestrian circulation system throughout the district, linking the Lenox and Buckhead MARTA stations. 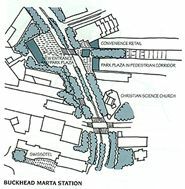 This would include construction of a north entrance to the Buckhead MARTA station and a corridor through the Buckhead Loop area to connect to Phipps Plaza. Shuttle bus service through the area also is recommended. 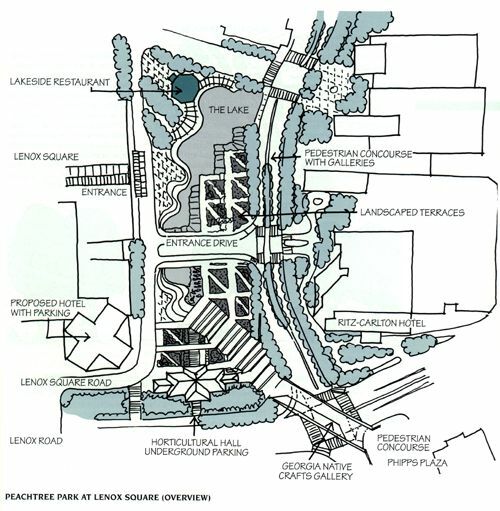 The panel's potentially most spectacular recommendation is: Create Peachtree park at Lenox Square. Below is a suggested design that would replace the current below-grade surface parking along Peachtree Road with underground parking topped by a landscaped park with a lake, restaurants and plazas. The proposal includes building a pedestrian concourse under the Peachtree-Lenox intersection to connect the lower levels of Lenox Square and Phipps Plaza. 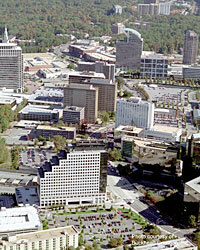 Preserve the character of Buckhead Village, is the sixth and final recommendation. The panel urges continuation of the low-rise urban village character that gives this popular area its unique flavor. 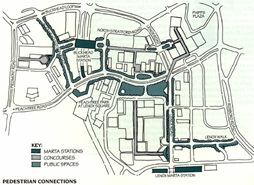 It also recommends encouraging pedestrian promenades and low-rise multi-family residences, galleries and shops to enhance the area as a daytime as well as nightlife destination. The Buckhead Blueprint suggested a new public space at the center of Buckhead Village, and this plan also encourages that idea. 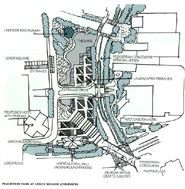 The bird's-eye view at right emphasizes the pedestrian orientation of the plan. All together, the six recommendations aim to make Atlanta's favorite district a place where people want to walk between work, shops, home and entertainment, where visitors are welcomed by a beautiful, human-scale environment, where elderly residents can find comfortable housing and feel safe walking and where alternative transportation is available to everyone. 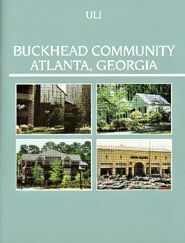 Complete copies of this study are available in Buckhead libraries. 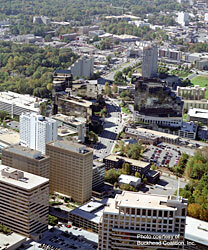 Excerpt permission was granted by the Urban Land Institute and the Buckhead Coalition.